The Kate Ross Quintet, featuring Dave Irwin – Bass, Caleb Hutslar – Piano, Roger Myers – Drums, Craig McMullen – Guitar, and Kate Ross on vocals – will perform at Sidebar Restaurant’s lower level (Jazz on Main) this Saturday night November 9th, 2013 from 8:00 p.m. until 11:00 p.m to celebrate the release of her new album entitled “People Make the World Go Round“. Kate’s performance is dedicated to her bass player Dave Irwin, who is battling Colon Cancer. A portion of the band’s proceeds to be donated to The American Cancer Society. Come out and celebrate life, have some fun, and support this worthy cause. 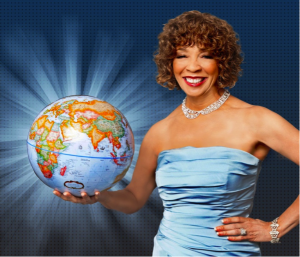 Also known as Kathy Kimbrough-Ross, Kate has been charming Columbus, OH audiences for more than three decades, delivering expert renditions of American popular songs, jazz and R&B songs in her distinctive contralto style. Equally happy as a solo artist or accompanying a trio, quartet or big band, Kate’s performance list reads like a Who’s Who of jazz and R&B music and includes several Grammy Award nominated artists. At a performance with singer songwriter Jeffrey Osborne in 1997, she nearly stole the show with some spirited woo-wooing on his track You Should Be Mine (the Woo Woo Song). In Columbus, she has appeared with bands including the Bobby Floyd Trio, The Hank Marr Trio, Eddie Baccus Jr. the OSU Jazz Orchestra, The Broad & High Jazz Trio and many others. She is currently the featured vocalist with Vaughn Wiester’s Famous Jazz Orchestra as well as her own band The Kate Ross Quintet.